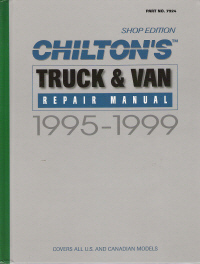 Used Manual in Very Good Condition: This book covers Trucks, Vans & SUVs from 21 manufacturers listed below for the years 1995, 1996, 1997, 1998 & 1999. By far, the best deal for repair information if you are a professional mechanic. Designed for the professional technician, Chilton Service Manuals are comprehensive and technically detailed, offering TOTAL maintenance, service and repair information. Great for schools, small & large shops, libraries & fleet owners. Comprehensive, technically detailed content including 4 Wheel Drive, Transfer Cases & Hubs, Brakes, Steering, Engine Disassembly, Fuel Systems, Tune-Up, Parts Replacement & more. Repair procedures are supported by exploded-view illustrations, diagrams, and specification charts, all carefully organized by system and model for easy reference. Special tools are described and illustrated so that performing the repairs is easier and quicker. Step-by-step procedures, from drive train to chassis and related components, help yield fast, accurate repairs.